Mr Piyush Goyal, the interim Finance Minister, rolled out the interim budget 2019-2020 in the absence of Shri Arun Jaitley. Apart from the rural India, this year’s budget was certainly for the middle class. Here are the highlights of India Budget 2019 – 2020. As a result of continuous reduction in GST, most items of daily use now fall in the 0% to 5% tax slab. Also, cinema goers who were subject to multiple taxes upto 50% are now paying much lower tax at 12%. The GST exemption limit for small businesses has been doubled from Rs 20 Lakh to Rs 40 Lakh in case of goods. Further, small businesses with a turnover of Rs 1.50 Crore are given an attractive composition scheme. According to the scheme, they would be required to pay a flat GST rate of 1%. Additionally, such taxpayers are required to file one tax return only. Similarly, small service providers with an annual turnover of Rs 50 Lakhs can go for composition scheme. Such service providers would now need to pay a GST of 6% instead of 18%. Thus, with the grant of such GST exemptions and benefits, 35 Lakh small traders, manufacturers and service providers would be benefited. Note: Hilly and north eastern states have been given an option to choose either Rs. 20 lakhs or Rs. 40 lakhs as the turnover limit for GST exemption within a week’s time. Small businesses with a turnover of Rs 1.50 crores would pay a flat GST rate of 1%. They will now file one tax return only. Small service providers with an annual turnover of Rs 50 Lakhs would now pay a GST of 6% instead of 18%. 35 Lakh small traders, manufacturers and service providers to benefit from such exemptions. The average monthly tax collection in the current year came out to be Rs 97,100 Crores per month. Such numbers were certainly high if one compares it with the first year monthly GST collection of Rs 89,700 Crores. Individual taxpayers with an annual taxable income of upto Rs 5 Lakhs will now get full tax rebate. This means, no income tax will have to be paid by individual falling in this income category. It is because the tax rebate which was earlier Rs 2,500 has now been raised to Rs 12,500. This makes the income tax turn out to be NIL for taxpayers earning less than Rs 5,00,00 per annum. Such a rebate is given to an assessee under section 87A of the Income Tax Act, 1961. The last amendment made to the section was undertaken in the Finance Bill 2017. Accordingly, an assessee whose total income does not exceed Rs 3,50,000 is entitled to get a deduction from the amount of income tax on his total income. Such a rebate or deduction would amount to the lower of 100% of such income tax or Rs 2,500. However, in the Finance Bill 2019, an amendment has been made to such a rebate. Thus, now, an assessee whose total income does not exceed Rs 5,00,000 is entitled to get a deduction from the amount of income tax on his total income. 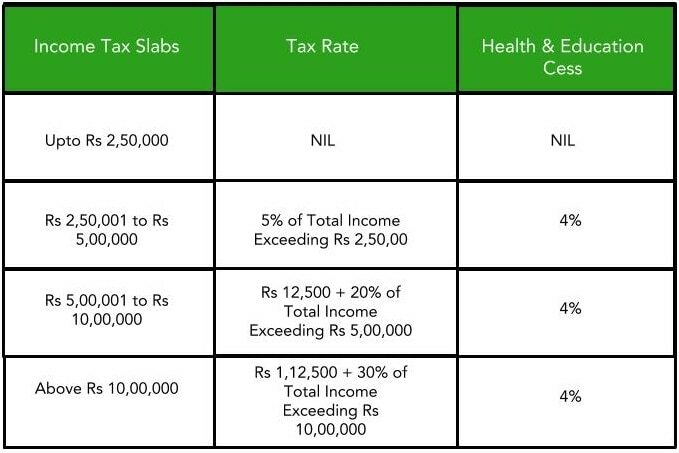 Such a rebate or deduction would amount to the lower of 100% of such income tax or Rs 12,500.The purpose of such a rebate is to reduce the tax burden of individuals in the lower income bracket. Medical Expenditures on Senior Citizens etc. As a result of this exemption, a tax benefit of Rs 18.50 Crore to an estimated 3 Crore middle class taxpayers would be provided. Small businesses and start-ups were also given special benefits and incentives. Also, the overall compliance processes for them were simplified. Accordingly, the threshold limit for presumptive taxation of business was raised from Rs 1 crore to Rs 2 crore. For the first time, the benefit of presumptive taxation was extended to small professionals. The threshold limit for small professionals was thereby fixed at Rs 50 lakh. Also, to promote a less cash economy, the presumptive profit rate has been reduced from 8% to 6%. And finally, the tax rate for companies with turnover of up to Rs 250 crore was reduced to 25%. This covers almost 99% of the companies. The Standard Deduction for Salaried Employees has increased from Rs 40,000 to Rs 50,000. Consequently, tax benefit of Rs 4,700 Crore to more than 3 Crore salaried persons and pensioners would be provided. At present, income tax on notional rent is payable if one has more than one self-occupied house. In the interim budget, government has proposed to exempt levy of income tax on notional rent on a second self occupied house. TDS limit on such interest earned has been raised from Rs 10,000 to Rs 40,000. Additionally, TDS limit for deduction of tax on rent is proposed to be increased from Rs 1,80,000 to Rs 2,40,000. This has been undertaken to provide relief to small taxpayers. Earlier, the benefit of the rollover of capital gains under the Income Tax Act was restricted to investment in one residential house. This has now increased from investment in one residential house to two residential houses. Such an increment is for a taxpayer having capital gains upto Rs 2 Crore. And such a benefit can be availed just once in a lifetime. For making more homes available under affordable housing, the benefits under section 80 IB (A) of the Income tax Act have been extended for one more year. This means housing projects approved till March 31, 2020 can claim benefits under section 80 IB (A). In the last 5 years, India witnessed its best phase of macro-economic stability. It became the 6th largest economy in the world on the grounds of high growth rate, single digit inflation and improved fiscal balance. The ruling government undertook transformational structural reforms to get Indian economy back on track. Accordingly, here are the highlights of the efforts undertaken by the ruling government and its impact on the Indian economy. Average rate of Inflation during 2009 to 2014 was 10.1%. The ruling government, however, was able to bring it down to 4.6%. Such a rate is lower than the inflation during the tenure of any previous government. This claim can be backed by the inflation numbers achieved during the month of December 2018. The rate of inflation in December 2018 stood at just 2.19%. With the efforts of the incumbent government, the fiscal deficit was brought down to 3.4% in 2018-2019. This, however, touched around 6% seven years ago. Similarly, the current account deficit which was around 5.6% six years ago was curtailed to 2.5% of GSP this year. Accordingly, the government was able to pass on the benefit of decreased fiscal deficit to the States. Thus, the share of states in central taxes was increased from 32% to 42%. Owing to strong economy, India was able to attract Foreign Direct Investment (FDi) of $ 239 billion during the last five years. In addition to this, the FDI policy was liberalized. Such a policy allowed major FDI to come through automatic route. Institutionalization of Insolvency and Bankruptcy Code. This helped banks to recover an NPA loans amounting to Rs 3 Lakh Crore. Recapitalization of an amount of Rs 2.6 Lakh Crores. This was undertaken to bring back the health of public sector banks back on track. Reforms like amalgamation of banks was brought about. Such a reform was undertaken to garner benefits of economies of scale, improved access to capital and wider geographic coverage. The New Pension Scheme has been liberalized. The government has increased its contribution towards the fund by 4%. However, the contribution of the employee remains 10%. Thus, the total contribution towards the fund both by the government and an employee turns out to be 14%. Additionally, the maximum ceiling of bonus given to labourers has been increased from Rs 3,500 per month to Rs 7,000 per month. And the maximum ceiling of the pay has been increased from Rs 10,000 per month to Rs 21,000 per month. And as for the gratuity payment, the ceiling has been enhanced from Rs 10 lakhs to Rs 20 lakhs. Moreover, if we talk about the minimum wages of labourers of the all categories, the same has increased by 42% during the last five years. Also, the ceiling of ESI’s eligibility cover has been increased from Rs 15,000 per month to Rs 21,000 per month. And the minimum pension for every labourer has been fixed at Rs 1,000 per month. In the event of death of a labourer during service, the amount to be paid by EPFO has been enhanced from Rs 2.5 lakh to Rs 6 lakh. And under the Anganwadi and Asha Yojana, honorarium has been enhanced by about 50% for all categories of workers. A worker joining the yojana at the age of 18 will have to contribute Rs 55 per month till the age of 60. Moreover, government will deposit an equal amount in the pension account of the worker every month. Therefore, for the benefit of the unorganized workers, the government has allocated Rs 500 Crores for this scheme. The scheme will be implemented from 2019 itself. A committee will be set up under NITI Aayog to identify De-Notified, Nomadic and Semi-Nomadic Communities. These communities have not yet been classified. Government will set up a welfare development board under the Ministry of Social Justice and Empowerment. This board will implement Welfare and Development Programs for these communities. Under the Ujjwala Yojana, Government had promised to deliver 8 Crore free LPG connections. This reform was undertaken to enhance the quality of life of women in rural India. Currently, more than 6 Crore connections have already been disbursed. Remaining are due by next year. Under this scheme, more than 70% of the beneficiaries are women. These women are getting affordable and collateral free loans to start their own business. Under the Pradhan Mantri Kaushal Vikas Yojana, more than 1 Crore youth are being trained to earn livelihood. Self employment schemes like MUDRA, Start-Up India and Stand-Up India have been implemented. These schemes have been put in place to derive full potential of the Indian youth. Under MUDRA Yojna, 15.56 Crore loans have been given which amount to Rs 7,23,00 Crore. Additionally, to gain benefits of technologies like Artificial Intelligence, the government has proposed a National Program on Artificial Intelligence. To empower the MSME sector, government has recently introduced a host of measures. According to a new scheme, loans upto Rs 1 Crore will be sanctioned in 59 minutes. Also, GST registered SME units will get 2% interest rebate on additional loan of Rs 1 Crore. Moreover, government enterprises would now have to source 25% of the material from the SMEs. Of which, minimum material of 3% will be sourced from women SMEs. The scheme of “One Pension One Rank” was pending from the last 40 years. Earlier governments announced the Scheme in three financial budgets. However, they were able to sanction only Rs 500 Crore in 2014-2015 interim budget. But unlike the previous governments, the ruling government has already sanctioned over Rs 35,000 Crores under the scheme. Additionally, it has announced a substantial increase in Military Service Pay (MSP) of all the service personnel. And special allowances have been given to naval and air force personnel deployed in high risk duties. For the first time in 2019-2020, the Defence Budget of India will cross Rs 3 Lakh Crores. To give impetus to the backward classes, the Indian government maintains its stance for providing reservation to the backward classes. The government has now ensured 10% reservation for the poor in educational institutions and government services. Thus, 25% extra seats which amounts to approximately 2 Lakh will be reserved for ST/SC/Others. In order to provide food at affordable prices to the poor, the Indian government spent around Rs 1,70,000 Crores in the year 2018-2019. This amount was almost double the expenditure of Rs 92,000 Crores made in the year 2013-2014. And, to further aid such an initiative, the government has announced an allocation of Rs 60,000 Crores towards MGNREGA for the year 2019-2020. The government has allocated Rs 19,000 Crores towards the Pradhan Mantri Gram Sadak Yojana (PMGSY). However, the allocation under such a scheme in the year 2018-2019 was Rs 15,500 Crores. In the same way, a total of 1.53 Crore houses have been built under the Pradhan Mantri Awas Yojana. The government of India provided free electricity connections to rural households under the Saubhagya Yojana. And as per the initiative, all willing families would get electricity connection by March 2019. Furthermore, 143 Crore LED bulbs were provided to such families with the help of the private sector. All such measures have resulted into savings of approximately Rs 50,000 Crore per year in electricity bills of the poor. The government of India launched the world’s largest healthcare program by name of Ayushman Bharat. Such an initiative was undertaken to provide medical treatment to around 50 Crore people. As per the data, close to 10 lakh patients have benefitted through free medical treatment made available under the scheme. Such medical treatments would have otherwise costed close to Rs 3,000 Crores. Additionally, benefits under Pradhan Mantri Jan Aushadhi Kendras were given to lakhs of poor and middle class people. These benefits included providing essential medicines, cardiac stents and knee implants at reduced prices. The government announced setting up of 22nd AIIMS in Haryana apart from 21 AIIMS operating in the country presently. Additionally, under the Aspirational Districts Programme, the government provided targeted development to 115 most backward districts of the country. With the aim to increase the income of farmers, the incumbent government fixed the Minimum Support Price (MSP) of all 22 crops at minimum 50% more than the cost. Additionally, the government also launched the historic program namely, Pradhan Mantri Kisan Samman Nidhi (PM-KISAN). Under such program, small farmers having a land of upto 2 hectares will be provided direct income support amounting to Rs 6,000 per year. Such income support will be transferred directly to the bank accounts of the beneficiary farmers. This transfer will take place in three equal installments of Rs 2,000 each. With such an initiative, around 12 crore families are expected to be benefitted. This program has been made effective from December 1, 2018. 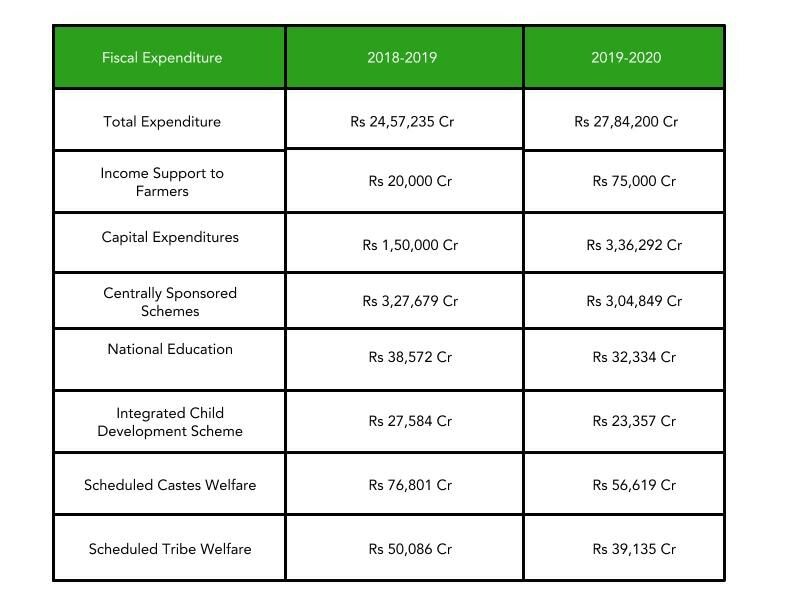 And a total outlay of Rs 75,000 Crores has been proposed for PM-KISAN program by the government for the year 2019-2020. In addition to the above, the government doubled the amount of interest subvention in order to provide affordable loans to the farmers. Furthermore, the crop loan to farmers increased to Rs 11.68 lakh crore in year 2018-19. Not only this, support has also been given to the Animal Husbandry and Fisheries sector. The allocation towards Rashtriya Gokul Mission has been increased to Rs 750 Crores in the current year. And to enhance genetic upgradation of cows, government of India introduced the setting up of Rashtriya Kamdhenu Aayog. As for the fisheries segment, the government of India has decided to create a separate Department of Fisheries. To further augment the sector, the government announced extension of Kisan Credit Card Scheme to the Animal Husbandry and Fisheries farmers. Such farmers availing loans through Kisan Credit Card have now been provided with the benefit of 2% interest subvention. And in case such farmers repay loans within time, an additional 3% interest subvention would also be given. Lastly, relief would also be extended to the farmers affected by severe natural calamities. The government has decided to provide benefit of interest subvention of 2% and prompt repayment incentive of 3% for the entire payment of reschedulement. Currently, the crop loans of the are rescheduled. And such farmers get the benefit of interest subvention of 2% in the first year of rescheduled loan itself. Under the Udaan Scheme, the airfares have been subsidized to encourage more people to fly. And the number of airports made operational under the scheme has crossed 100 after the upcoming of Pakyong Airport in Sikkim. Thus, domestic passenger traffic has doubled during the last five years. Today, India is the fastest highway developer in the world. Each day, 27 kms of highways are built within the country. And projects that were stuck for decades have now been completed. These include the Eastern Peripheral Highway around Delhi and the Bogibeel rail-cumroad bridge in Assam and Arunachal Pradesh. As for the development of ports, the flagship programme Sagarmala has been instituted. Such a programme aims to develop ports along the coastal areas of the country for faster handling of import and export cargo. Additionally, container freight movement has started on inland waterways from Kolkata to Varanasi. As far as Indian Railways is concerned, certain safety measures were introduced in the year 2018. All unmanned level crossings on broad gauge network have been eliminated. The government also proposes to introduce India’s first indigenously developed and manufactured semi high-speed Vande Bharat Express. This will give the Indian passengers world class experience with speed, service and safety. Accordingly, the budget proposed for the Indian Railways for the year 2019-2020 stands at Rs 64,587 Crores. And the Railways’ overall capital expenditure programme is of Rs 1,58,658 crore. The north-eastern states have also been given significant benefits of infrastructure development. Recently, Arunachal Pradesh has been brought on the air map. While Meghalaya, Tripura and Mizoram have come on India’s rail map for the first time. Thus, the allocation proposed for the North-Eastern states has been increased by 21% to stand at Rs 58,166 Crores in 2019-2020. Groundbreaking schemes like Jan Dhan-Aadhaar-Mobile (JAM) and Direct Benefit Transfer have been introduced. Such schemes aim to bring India under the net of formal banking. Correspondingly, nearly 34 crore Jan Dhan bank accounts have been opened in the last five years. Additionally, Aadhaar is now broadly implemented. Such an initiative has ensured that the poor and middle class Indians directly receive the benefits of Government schemes into their bank accounts. In order to encourage entertainment industry, a single window clearance for shooting films is now made available to the Indian filmmakers. Such a facility was only available to foreigners previously. However, under the former system, Indian filmmakers had to obtain multiple permissions from central and state governments to shoot at Indian locations. Such a system was time consuming and increased the costs. But now with single window clearance, boost would be given to the entertainment industry.